Drinking your Shakeology to help support your healthy lifestyle is simple. Reading the back of your Shakeology bag, on the other hand, can be a little more complicated. 1. PROPRIETARY PROTEIN BLEND: Whey, Pea, Sacha Inchi, Chia, Flax, Quinoa. Protein is made up of amino acids, the body’s primary building blocks. Muscles, bones, skin, internal organs—and much more—are all made of amino acids. What’s more, we’re in a constant state of breaking all these things down and rebuilding them. Long story short, we’re made of protein and therefore we need to consume it to stay healthy. This blend is formulated with a variety of quality protein sources. 2. PROPRIETARY SUPER-FRUIT/ANTIOXIDANT BLEND: Camu-Camu, Acerola Cherry, Bilberry, Lycium Berry (Goji Berry), Green Tea, Luo Han Guo, Pomegranate, Rose Hips, Vitamins A, C, E.
A number of your body’s vital processes depend on a series of chemical reactions called the oxidation-reduction (redox) cycle. Free radicals are generated by oxidation reactions. Antioxidants inhibit oxidation. When in balance, they’re both good things and necessary for a number of biological processes. Unfortunately, a number of 21st century issues, including lousy diet and stress, can promote free radicals, causing an imbalance between free radicals and antioxidant levels. Consuming antioxidants helps bring balance back, therefore helping to fight free radical damage and helping support a healthy immune system. Vitamins A, C, and E are known antioxidants. Also, key superfoods in Shakeology have been specifically selected for their antioxidant properties. 3. PROPRIETARY SUPER-GREEN/PHYTONUTRIENT BLEND: Moringa, Chlorella, Spirulina, Spinach, Kale. Phytonutrients are substances distinct to plants that also happen to benefit the animals that eat them (including us). They’re also what give fruits and veggies their various colors, thus the saying, “Eat the rainbow.” The nutrition science community has been gaga over phytonutrients for years, as new studies come out almost daily—most demonstrating how they help support human health and vitality. While we still recommend you eat your veggies, this Shakeology blend will give you a phytonutrient leg up. 4. PROPRIETARY ADAPTOGEN BLEND: Ashwagandha, Astragalus, Cordyceps, Maca, Maitake, Reishi, Schisandra. Adaptogens are just what they sound like: substances that have traditionally been used to help the body adapt and respond to the effects of stress—and they’ve been being used by cultures across the planet for centuries. 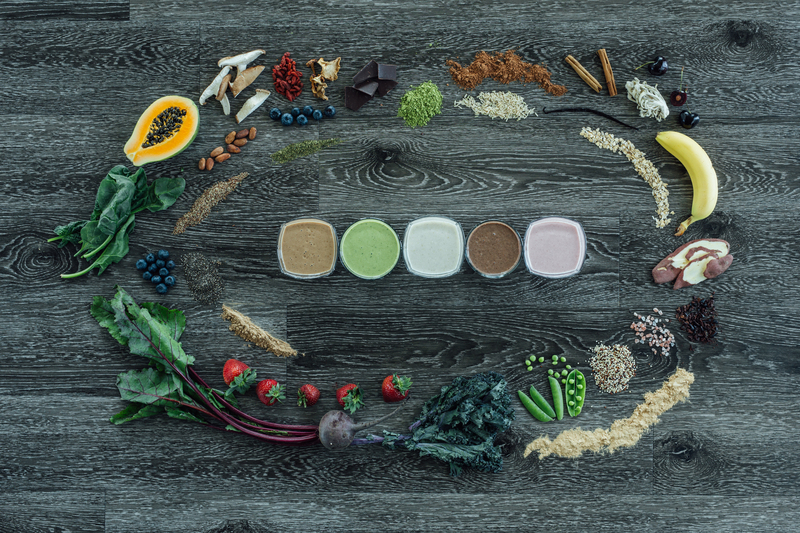 While there’s no shortage of science behind many of the ingredients in Shakeology, this blend focuses more on holistic approaches, traditional practices, and ancient wisdom to offer ingredients that can help promote homeostasis, or balance, in the body. 5. PROPRIETARY PRE- AND PROBIOTIC/DIGESTIVE ENZYME BLEND: Yacon Root, Chicory Root, Bacillus coagulans , Amylase, Cellulase, Lactase, Glucoamylase, Alpha-Galactosidase, Invertase. Your intestines are loaded with bacteria—and much of it is hugely beneficial in a number of ways, including helping properly break down food and creating important nutrients like short-chain fatty acids. Probiotics such as Bacillus coagulans are digestible forms of these beneficial bacteria. Prebiotics, including yacon root and chicory root, act as food for these important little critters. Consuming a combination of the two can help support the biome in your belly, therefore supporting a healthy digestive system. Enzymes are catalysts that facilitate chemical reactions. Digestive enzymes, in particular, break down the food you eat, therefore helping with nutrient absorption. Amylase, for example, breaks down carbohydrates. (Fun fact: your saliva contains amylase so the digestive process actually begins the moment you start chewing.) Lactase breaks down dairy. Anything in Shakeology with an “ase” at the end of it is an enzyme.